New analysis of data from HUD's Family Options Study of families' experiences in shelter and 20 months later shows that families experiencing homelessness are generally connected to public benefits at similar rates to other families in deep poverty. This non-experimental analysis finds that homeless families receive TANF, publicly funded health insurance (including Medicaid, CHIP, and state-funded insurance), and SNAP at equal or greater rates than other families in their communities who are also living in deep poverty. 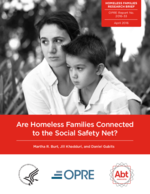 This suggests that disconnection from the safety net does not appear to distinguish families experiencing homelessness from other families in deep poverty.